Question: Why did you invest in LANAP? Dr. Schultz: "I invested in the PerioLase because I found out that it was effective in treating periodontitis. This was through clinical studies that I became aware of and histologic evidence (microscopic) of it facilitating the reformation of a functional periodontal attachment to a root(s) previously attacked by periodontal disease. In addition the procedure was far less physically challenging to the patient versus conventional flap surgery (much less discomfort)." Question: What kind of results have you had so far? Dr. Schultz: "What I have seen in the average periodontitis case treated via the LANAP protocol or technique is significant pocket reduction and a dramatic return to health of the gingiva (gums) as evidenced by coral pink tissue that does not bleed upon probing. We have yet to see a case not improve and have saved teeth that would normally have been extracted and now returned to function." Question: Who is a good candidate for LANAP? Dr. Schultz: "Any one afflicted with periodontitis is a good candidate. Anticoagulant (blood thinner) therapy does not have to be interrupted since the laser can control clotting. The procedure is performed with the patient being “numb” with standard dental anesthetics (local anesthesia). Sedation agents can be used for the anxious person." Question: How has this changed how you treat periodontal disease? Dr. Schultz: "Using the PerioLase has resulted in less conventional periodontal (flap) surgery and retention of teeth with more questionable prognoses. In the future, I expect this will lead to a decrease in the need for dental implants in certain patients." 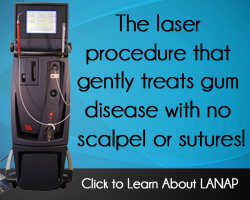 Question: How does LANAP compare to traditional GTR in terms of results and patient experience? Dr. Schultz: "Comparing LANAP to conventional surgery we notice that the patient experiences very little discomfort. They have no sutures (stitches) and their activities do not need to be modified much at all if any. In general, the results are similar to conventional surgery and appear to be very stable. Conventional surgery with or without bone grafts, etc., is kept in reserve for areas that do not completely respond. We wait about 18 months before that subject is discussed."